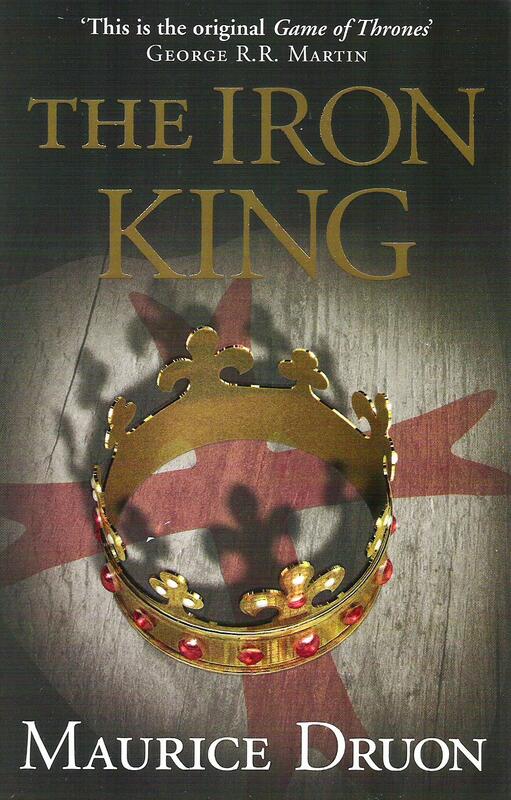 The Iron King is the first in a series of novels by French author Maurice Druon, which deal with the royal struggles of several medieval rulers. Touted by George R.R. Martin as “the original Game of Thrones”, Druon’s series has enjoyed a resurgence in popularity recently, and can be found in major bookstores. I eagerly picked up a copy of this first novel, but was disappointed to find it fell short of Martin’s praise. The Iron King deals with France’s Philip IV “The Fair” (1268-1314) and a few scandals of his reign, namely the destruction of the Order of the Knights Templar and the adultery of two of his daughters in law. This seems like pretty juicy stuff – and it is – yet The Iron King manages to fall flat in its retelling of this pivotal part of history. Partly, this is because of Druon’s characters, which never really manage to jump off the page, and partly, this is because of the inclusion of side-plots and romances which aren’t nearly as captivating as the royal scandals themselves. Druon clearly admired Philip’s ruling style, writing him as a cool, aloof monarch who yet feels misunderstood. Isabella of France, his daughter and wife of England’s Edward II (and incidentally one of my favourite figures from history), is likewise admired, but stays a minor character. Grand Master of the Templars Jacques de Molay does have some feisty moments, including roaring out his curse on Philip’s house “to the thirteenth generation”. (That is some great stuff right there.) There are plots and revenge and murders and sexcapades, but if you are familiar with this moment in history, there are no surprises in store. In Druon’s defense, he has a really great grip on his history, and even includes page after page of historical notes at the back to help readers along. I did love these notes, and my favourite is this one: “the term ‘budget’ came from the word bougette which designated the little purse that the Norman lords, who conquered England, wore at their belts” (p.339). Who knew? Druon was a serious researcher and a hero of the French resistance – both redeeming qualities which shouldn’t be discounted. I really admire the man, even if I won’t be rushing out to buy his next book. Readers who are not familiar with Philip the Fair’s reign will find The Iron King to be a more entertaining way to learn real history than reading from a textbook, but Maurice Druon’s novel does not hold the shocks and surprises or lovable and despicable characters of A Game of Thrones. I do recommend flipping to the endnotes for some really great tidbits, but I’ll have to leave the series to Druon’s “many and diverse fans,” such as (the front matter claims) “George RR Martin, Nicolas Sarkozy and Vladimir Putin”.